Anyone who wonders about my fascination with mid-century frankenfoods need look no farther than my mother’s holiday recipe collection. This very 1960s New England side dish is a favorite in my family at Rosh Hashanah and Thanksgiving alike. A word of warning, learned from experience: off-brand (e.g. kosher) gelatins haven’t jelled as firmly as needed for a mold. (If you know the trick to make them work, please share in the comments. )There’s some debate in my family as to which flavor of Red Jell-O works best for the recipe, but I’m pretty sure we have used any number of flavors and it’s come out fine each time. My mother wasn’t much of a cook. My brother and I talk about growing up on Hungry Man TV Dinners, and many of my favorite holiday recipes involve opening cans to be mixed together and heated. However, there were certain dishes my mother perfected over time. She was proudest of her brisket. This morning, I was going to try to recreate the recipe from memory, but I decided to try one last Google search, just in case. Lo and behold, someone I have never heard of entered the recipe into Tastebook.com, attributed to my mother to dispel any doubt. Thanks, Debbie Pullen, whoever you are! Have you heard about Pinterest? It’s a relatively new social sharing website that has captured the imagination of women in particular across the USA. With its emphasis on images, it’s particularly well-suited for sharing links fashion, decor, and food-related websites. Here at JewishBoston.com HQ, we’re obsessed. We’ve created our own set of Pinboards, including one just for Passover alongside the more common collections of crafts, recipes, and so on. If you spend a little time on Pinterest, you’ll notice certain trends emerge. For example, people seem to be obsessed with food that looks like Lego. There’s never a shortage of LOLCats. And people seem to like to put food on sticks. 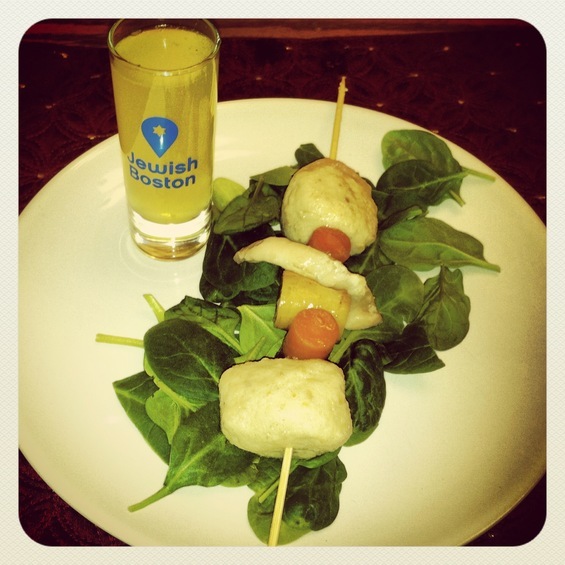 It was that last realization that caused me to cook up this little dish, Matzo Ball Soup Kabobs. Think of it this way – most people are way more excited about the matzo balls than any other part of the soup. Sure, we may eat a carrot or two, and if your family is so inclined as to include actual chunks of chicken, that’s a bonus. But who needs to fill up on broth when there’s a huge, delicious meal ahead? The kabobs sole the problem — and can be served with just a shot of broth to wash it all down. If you prefer a more traditional take on soup, we have that recipe too. In fact, we have dozens of Passover recipes. 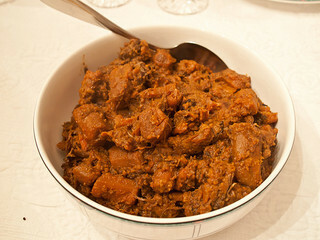 If you need more than recipes to assist in your Passover prep, check out our whole Passover Guide. And if you’re in the Boston area and need a jump-start on hosting your own seder, definitely request your free Seder in a Box. Finally, if you see things you like on our site — don’t forget to pin them on Pinterest! Many of my favorite holiday recipes fall firmly in the category of “semi-homemade,” and this delicious and surprisingly simple recipe for Blintz Soufflé is one of the best examples. Thanks to the tradition of eating dairy on Shavuot, this recipe always makes its way into my spring cuisine, but honestly, I love it so much that I make it year round. It’s hearty enough to be dinner but light enough for breakfast, and it’s just as good reheated as it is hot out of the oven. 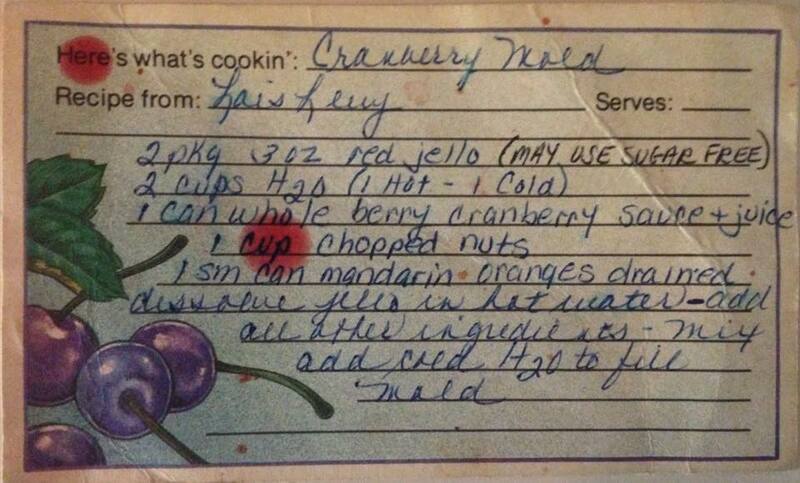 This version of the recipe comes from my mother, but I’m pretty sure she cribbed it from an accomodater who did the morning-after brunch for my brother’s bar mtizvah. Beat eggs well. 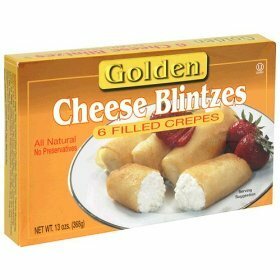 Add remaining ingredients and pour over blintzes. Bake at 350 for 30 to 35 minutes until slightly brown (firm and dry). My mother recommends baking longer than the recipe calls for, saying “It seems to take a little longer for the middle section to firm up, but watch the edges, you don’t want them to get too brown.” I suspect that’s because she often forgets to defrost the frozen blintzes in advance. Hosting a seder is hard work, especially if, like me, you are one person handling both the culinary and programmatic aspects of the dinner. That’s why in my family, many people help out by bringing their “specialties.” I’m sure many people have their own takes on Potato Kugel, but my cousin Ronnie’s is both delicious and easy, so I’m happy to share it with you. Of course, like many family recipes, there aren’t so many actual measurements in the version Ronnie sent me, so you may need to experiment a bit. Preheat oven to 350 degrees. Grease two 13″ x 9″ with olive oil or chicken fat. Beat eggs, and combine with shredded potatoes. Add enough Matzah Meal to thicken mixture. Add salt, pepper, and garlic to taste. Cover with aluminum foil and cook about 90 minutes; uncover and continue cooking until top browns. May be prepared ahead and reheated for seder. Serves an army with leftovers to enjoy throughout the week. Note: After I posted this recipe, I asked Ronnie to take a look to ensure I did justice to her creation. 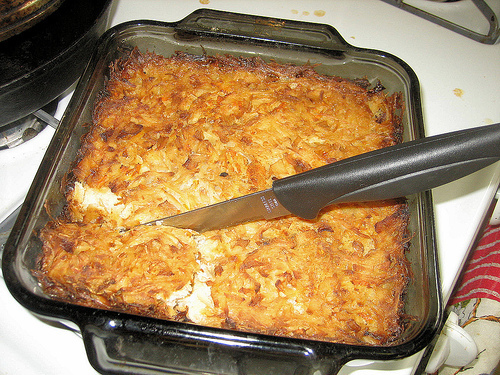 She wrote back, “You edited the hash brown potatoes and the onions, frozen for the working gal/guy – that’s what makes it so easy!” Her original recipe calls for three bags of Cascadian Farms pre-shredded potatoes and two, 12-oz bags of frozen chopped onions. I converted that to the recipe you see above because some people would not pre-cut vegetables on Passover (since the factories where they are packaged are likely not cleaned of hametz for Passover.) But if that’s not a concern for you, Ronnie is right — there’s no shame in taking shortcuts to make life easier for the working gal/guy!